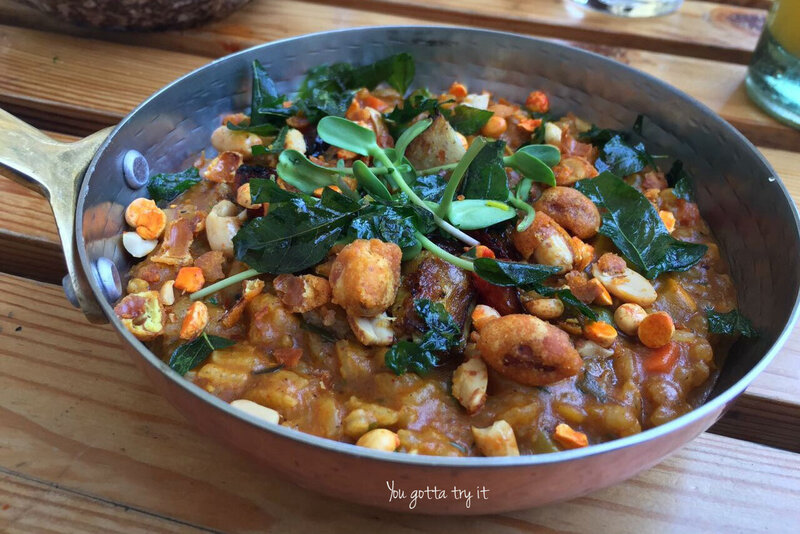 You gotta try it: Farzi Twist - Savour some amazing dishes with interesting twists at Farzi Cafe, Bengaluru! Farzi Twist - Savour some amazing dishes with interesting twists at Farzi Cafe, Bengaluru! The party is over and it’s time to try the new Farzi menu – Farzi Twist. On Ugadi day, when everyone was satiating veg meals, I decided to have a non-vegetarian feast. Farzi being one of my favorite restaurants in town for many reasons which include their modern Indianized food menu, friendly service, innovative cocktails, cool ambiance and most importantly the brain behind Farzi Cafe - Zorawar Kalra. The new menu is must try with whole lotta interesting dishes with some twists. 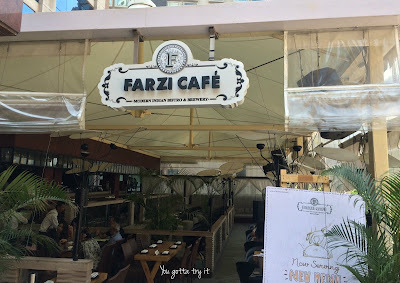 Unlike my other reviews I don’t want to go deep into each and every dish which will spoil the fun; after all, Farzi is all about experiencing the ‘Modern Indian cuisine’. I went with my love, who never been to Farzi before. Our booking was done well-in-advance. So getting a table was not an issue and the lovely ladies at the reception didn’t make us wait for even for few mins. The Chef Sombir greeted us and asked for the dietary preferences. While selecting the drinks, we completely left food order to the Chef. I have been to Farzi before and every time will ask for Chef’s suggestions and he will suggest the best they have. 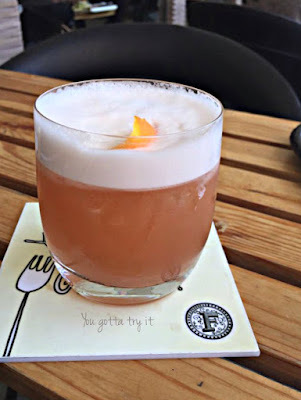 We started with an Amusé Bouse which is like a teaser or a glimpse of Chef’s creation. The Mishti Doi Amusé Bouche with Strawberry glaze will surely catch everyone’s attention with its beautiful presentation. 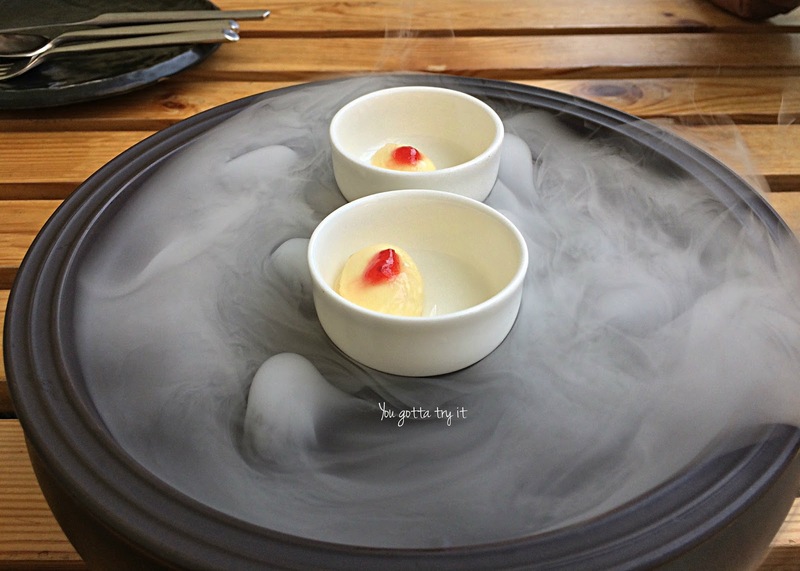 After tasting this, you will realize, we have super talented Chefs like Gaggan Anand in our country. Next, we got the ‘Dal Moth Matka Chaat’; a lip-smacking chaat with bhalla, green gram sprouts, crunchy green apple and pomegranate layered with yogurt, green chutney, and fennel seeds chutney. This was served on a cute clay pot. My summer heat tiredness just vanished after having this refreshing chaat. Along with appetizers, we ordered two cocktails – Santa Banta which is Vodka with Orange juice (my favorite cocktail Aam Pappad was not available) and Whiskey sour for the Whiskey lover. Andhra style Chilli Chicken Samosa with Suleimani chai chutney (Yeah.. you read it right) – If you love crispy thin patty samosa then this one is a much try. The local flavors with a twist of Suleimani Chai Chutney will surely make you happy. They serve this in cutting chai glass which is perfect for the Instagram pics. 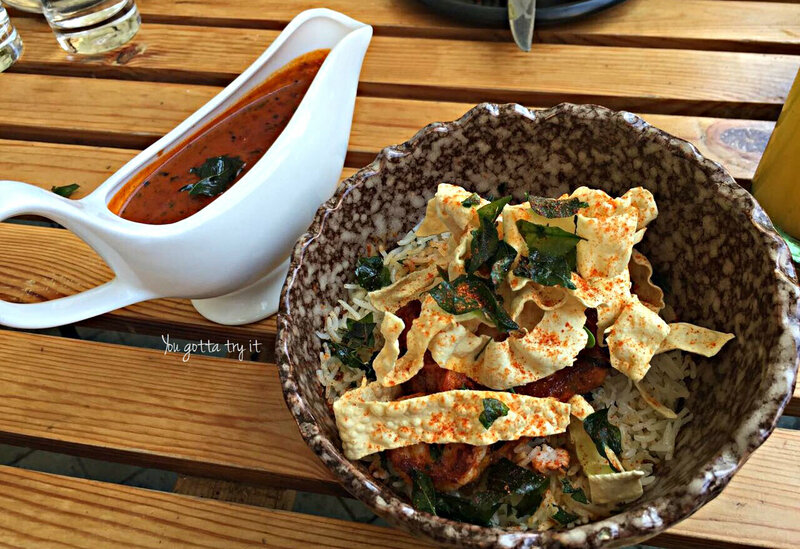 Guntur Chilli Chicken – I love anything super spicy and Guntur Chicken is a favorite dish for the same reason. At Farzi Guntur Chilli Chicken was not that spicy like you get in Andhra restaurants, but flavors were awesome. This appetizer with a mug of beer is all I wanted for this weather. Thai Green curry marinated Paneer Tikka – Both Farzi and MIP serves luscious paneer starters, easily the best in town. The garnishing of microgreens was brilliant. Sion Prawns Koliwada – This time I gave a break to my favorite Prawns appetizer- Tempura fried Prawns with Nimboo Mirch Air and tried the Aamchi Mumbai-style Sion Prawns Koliwada which was crispy fried tasty Prawns fritters served with shrimp chips. By this time, I was literally multi-tasking by eating, clicking pics, asking hubby’s opinion and looking around to see others expression when they see foam and fumes in their table. Next on the menu was Coorgi Pandi Ribs – Chef Sombir surprised me with this dish as I initially told him that I am not a pork lover. My perception has changed now and thinking why on earth I didn’t try this stuff before? Maybe everything has a right time :P This one was finger-licking good. Iyengar Bakery style toasties with stuffings Chicken Sukka and Scallion coriander chutney – People often crib about not getting Bombay sandwich here in namma ooru. Next time onwards, I would tell’em head to Farzi for it. The spicy sandwich made of Mangalore style Chicken Sukka stuffing and scallion- coriander chutney will surely impress you. With all the twists, I just love the new Farzi menu (doesn’t mean that I didn’t like the previous menu) and the variety of South Indian dishes added in the new menu. Before moving onto the main course we got a Kala khatta flavored sorbet which was just yum. For the main course, we had the ‘Charred Artichokes, Cherry Tomato Bisi Bele Bhaat’ and ‘Seafood Puli Munchi, Onion Ghee Pulao, and Wild greens’. Okay! I am not sure which one I liked most. Both came with interesting twists and tasted amazing. The twist in Bisi Bele bhaat is something which you won’t expect in your dream too. Desserts – Just like my belly size, my eating capacity has also been increased. We got a beautiful dessert which was Smoked Chena with flavored Shrikand and Almond Chikki. 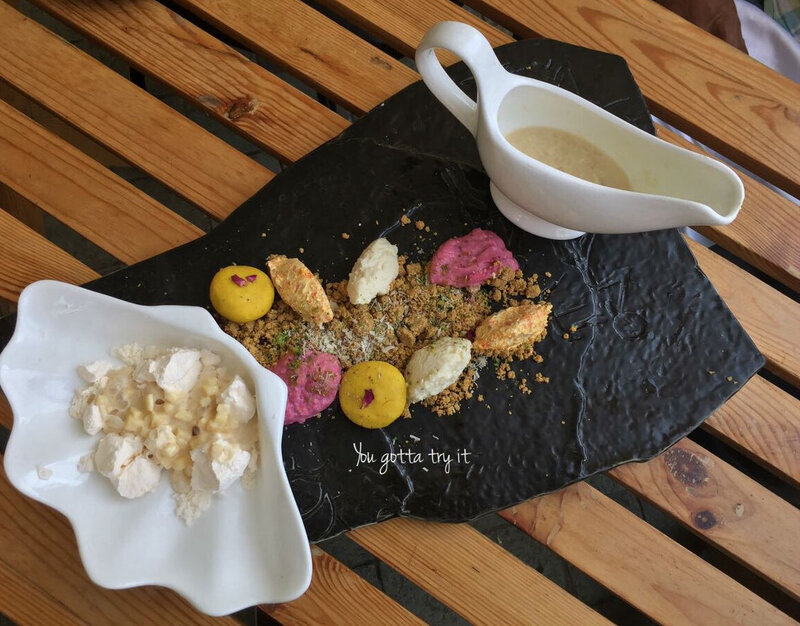 The sweetness of the delicious dessert was well-balanced and the crunch from almond chikki made it extra special. Textures of Indian dessert with 7 different textures consisted of Orange kalakand espuma, Blueberry pedha, Kesar Mango pedha, Chena payas, Carrot cream, Besan laddoo crumble and Apple custard rabdi. O.M.G… This was so colorful as well as sinfully blissful. I think my most favorite ones were the Carrot cream, Blueberry pedha, and Apple custard Rabdi. I swear! Indian desserts were never as good as this before. The traditional Indian meals end with paan and here at Farzi do not expect a ‘next door Maghai paanwala’ like you see in front of most of the restaurants. Some restaurants even have a special counter for paans. Expect the unexpected at Farzi. Here you get ‘candy floss paan’ which is light as air and just melts-in-mouth. 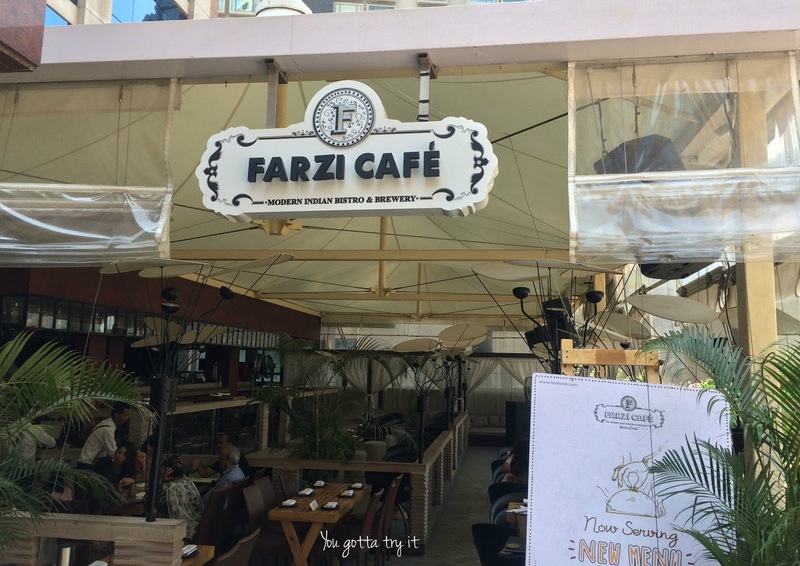 If you are around UB city and looking for something light and which won’t burn your pocket, then head to Farzi. They have a special short-eats menu for the evening (5 – 7.30 PM) and has some amazing stuffs like ‘Karela Calamari’, ‘Goat cheese and walnut tikki’ and much more. Overall my experience was great this time too and Chef Sombir did a gambhir job. I’m sure when I start traveling Farzi will be the top pick in my global list too :P. More than any other outlets, I’m keen on visiting the Dubai outlet as it’s doing extremely well without even serving alcohol. The new ‘Farzi Twist’ menu is all about savoring some exceptional fusion food and there is no change in the drinks menu.